“Religion: Conflict and Peace” was the theme of the International Association for the History of Religions’ 19th World Congress, which was held in Tokyo last week with participants from more than sixty countries. The IAHR is affiliated with UNESCO, and meets every five years in a different location. Despite the “History” part of the Congress’s name, scholars of contemporary religion are also included, and many of the top names in the Study of Religion were present. And since I currently live in Japan, I figured I ought to go along. The Congress ran from 24-30 March, and met in the exceptionally plush Takanawa Prince Hotel. It kicked off with an opening ceremony; various speakers said the kind of things you might expect, mentioning religion’s return to the public scene, the need to deconstruct the dualism of east and west, and so on. There were few words from Prince Mikasa, the Honorary Congress Chair and 90-year old younger brother of the late Emperor Hirohito, and a (rather bland) message from Prime Minister Koizumi. There were also a couple of cultural elements, including a performance of Buddhist chanting. Things then got a bit peculiar, with four hours of keynote addresses that seemed somewhat…off-key. The themes were the need for dialogue between religions and cultures and for religious leaders to serve as “public intellectuals”. What this has to do with the serious analytical study of religion was unclear – one speaker even made a bizarre call for a “new religion” to counter ecological problems. Everyone clapped politely, but this weird sermonizing appeared to cause a certain amount of discomfort in some; at the closing General Assembly on March 30 a couple of scholars called for the IAHR to re-affirm that although it may be global, it is not “ecumenical”. Fortunately, these theological ramblings were eventually relieved by a pretty decent reception. Business proper commenced the next day: a plenary meeting followed by dozens of panels in various conference and seminar rooms around the hotel. Naturally, the hundreds of papers on offer covered all kinds of topics, creating a dilemma: should I go to papers that dove-tail with my particular interests, or check out brand new subjects? Should I take the opportunity to see famous scholars, or go to younger researchers or those from less familiar countries? As expected, with such a large gathering quality was variable (I, by the way, registered too late to present a paper myself). There were some complex and original papers presented with great eloquence; others were good, but undermined by poor presentation skills; others again were a bit vague and descriptive, but were nevertheless useful introductions to various subjects. Far from all the papers actually addressed the Congress topic. Unsurprisingly, 9/11 and subsequent events formed part of several discussions: there was a plenary session led Mark Juergensmeyer (author of Terror in the Mind of God), and a lecture by Hans Kippenberg on the documents left behind by the 9/11 hijackers. Juergensmeyer, who has interviewed various terrorists and has visited post-invasion Iraq, had some interesting anecdotes and was congenial, but was slightly disappointing as he explicated the reasoning of religious terrorists in fairly obvious and general terms (it’s cosmic warfare, wouldn’t you know?). There was also a general consensus, made explicit in Juergensmeyer’s presentation but which popped up in various other discussions I attended, that Bush’s post-9/11 actions have been all wrong. Whatever my own views on that subject, I was troubled by the complacent way in which this assumption taken for granted and was dropped into the discourse as if there was no serious counter-view to be overcome. I saw one paper that briefly touched on Bernard Lewis, but that was about it. My trip to Tokyo was not spent entirely in the hotel; on Sunday I went on an excursion, and on Monday I slipped away for a bit of tourism of my own (in the pouring rain). Naturally, I took in the two big shrines – the Meiji Shrine, where the Emperor Meiji and his wife are enthroned as deities, and the controversial Yasukuni Shrine. The Meiji Shrine is pleasantly located in a large park, although the buildings are not particularly distinctive. 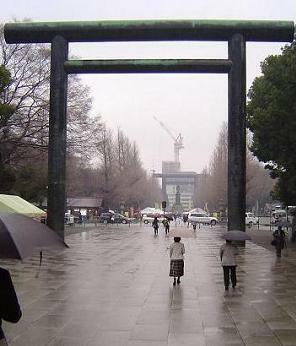 The Yasukuni Shrine is more impressive, and you approach it by passing under a series of huge torii gates. Here the Japanese war dead are enshrined as deities. As is well known, these deified dead include several convicted war criminals; the shrine is also controversial for enshrining particular soldiers against the wishes of relatives. There is a museum attached, which has some moving items – in particular, there is a collection bride dolls which were presented for soldiers who had died unmarried. On the other hand, there is a fair bit of famously dodgy commentary (in English – I cannot read Japanese): Japan only entered Korea to rescue it from China. Roosevelt had to convince America to go to war against Hitler, so he forced Japan to attack Pearl Harbour. Peace offers from the Japanese were continually rebuffed. 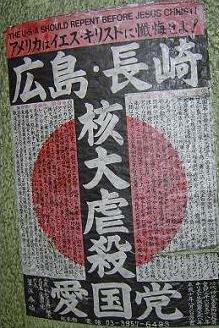 Japan was an inspiration for post-war anti-colonialism in Asia, particularly Gandhi. The only reference to Japanese war crimes in the whole building so far as I could see was a book for sale called The Alleged “Nanking Massacre”: Japan’s rebuttal to China’s forged claims. All a bit depressing, but I suppose most countries get by without really coming to terms with the crap things their ancestors did. Yasukuni Shrine’s impressive (?) museum is also capped off by its gift shop, which features such tomes as one “debunking” the Nanking massacre. I have a post on that on my blog. I said that the Shrine was impressive, not the museum attached.